Tens of thousands of you voted! 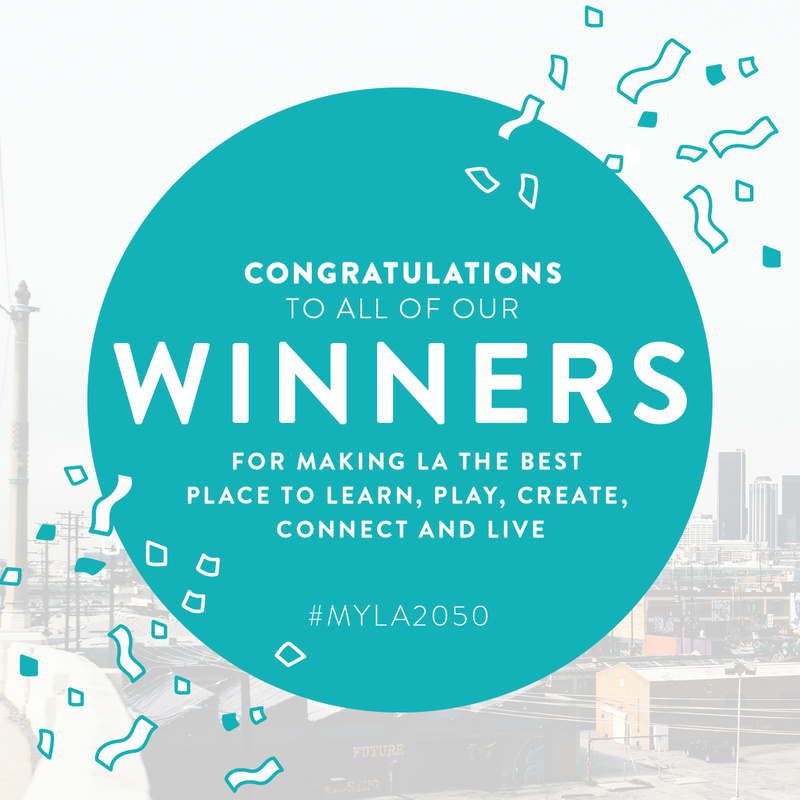 We would especially like to thank all of those who submitted their ideas to the My LA2050 Grants Challenge this year. Your passion for innovation, opportunity, and change is what drives progress in our region. From climate solutions to college access and from job training to food justice, we are flooded with amazing solutions to tackle our greatest challenges. Ten winning submissions will be selected based on their impact on the LA2050 goal areas, creativity and innovation, feasibility, and collaborative spirit. Five will be chosen from the top 10 voted of each category, and five more winners will be chosen from each category regardless of the number of votes they received. We cannot wait to announce the challenge winners and celebrate ALL of our submitters on December 8th! We are grateful for the additional support from the Roy and Patricia Disney Family Foundation which will be providing an additional $500,000 in grant funding to My LA2050 submitters, along with $100,000 from the Annenberg Foundation. The additional $600,000 will be allocated based on feedback from the funders - it could mean extra bucks for larger projects, or divided amounts for more submitters. In the meantime, we hope you will all continue to stay engaged with LA2050 and the amazing work that different organizations are doing in our community. Follow @la2050 on Twitter and Instagram, like LA2050's Facebook page, and sign up for our newsletter for updates and happenings in the LA area! In our third year of the My LA2050 Grants Challenge, we are even more confident that Angelenos hold the most creative answers to creating a thriving, equitable, sustainable Los Angeles. Thanks to YOU, we are on our way to a #BetterLA. Have questions about the My LA2050 Grants Challenge? Let's talk. RSVP and submit questions to [email protected]. We have been inspired by the Angelenos who have contributed to 500+ submissions, 100,000+ votes and more than $2 million injected into the LA community to support ideas--big and small, new and re-fashioned--to make LA the most amazing region in the world. We have seen what happens when you tap into the power of Angelenos to change Los Angeles for the better. And we want to see it happen again. We're excited for more submissions, more votes, and greater impact. Each year, we receive feedback about the My LA2050 Grants Challenge, and we try to respond to those lessons learned. We can't promise perfection, but we can aim for responsive evolution. To that end, the format of the challenge has changed slightly. There are still two ways to win: this year, the jury will select among the top 10 voted submissions in each goal area and will also select a winner in each category irrespective of votes.To submitters, we can't wait to see what you've got. You inspire us every year. Be sure to check out the FAQs and the submitter toolkit to help answer questions and provide tips to help you conduct outreach once the voting period has begun. We'll also host office hours in September and October to answer more of your questions about the challenge. Stay tuned here on the blog and on Facebook and Twitter for the dates. To the LA2050 community, we're excited for your participation in the challenge through voting. We can't do this without you and are thankful for your participation. Please share this opportunity with your networks to help amazing organizations change this awesome region.